Archaeology and Development Foundation – Phnom Kulen Program/Handout PNAS NewsShaded relief map of terrain beneath the vegetation in the Phnom Kulen acquisition area, with elevation derived from the lidar digital terrain model at 0.5m resolution and 4x vertical exaggeration. Green denotes previously-documented archaeological features; areas shaded red contain newly documented features indicative of an extensive urban layout. 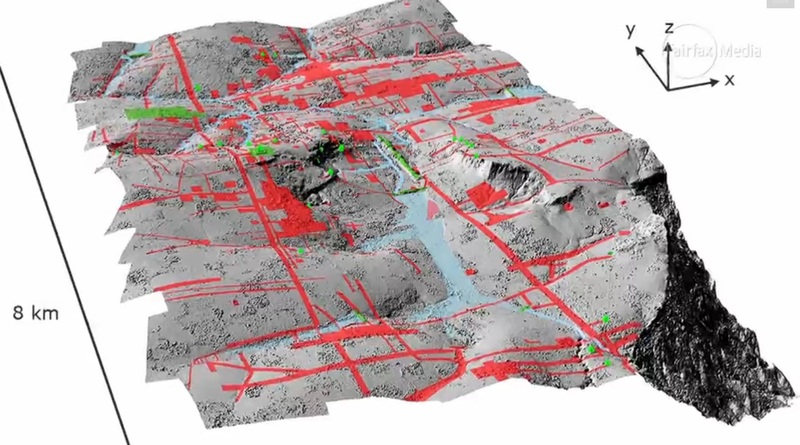 Airborne laser technology has uncovered a network of roadways and canals, illustrating a bustling ancient city linking Cambodia’s famed Angkor Wat temple complex. The discovery was announced late Monday in a peer-reviewed paper released early by the journal Proceedings of the National Academy of Sciences. The laser scanning revealed a previously undocumented formally planned urban landscape integrating the 1,200-year-old temples. The Angkor temple complex, Cambodia’s top tourist destination and one of Asia’s most famous landmarks, was constructed in the 12th century during the mighty Khmer empire. Angkor Wat is a point of deep pride for Cambodians, appearing on the national flag, and was named a UNESCO World Heritage Site. Archaeologists had long suspected that the city of Mahendraparvata lay hidden beneath a canopy of dense vegetation atop Phnom Kulen mountain in Siem Reap province. But the airborne lasers produced the first detailed map of a vast cityscape, including highways and previously undiscovered temples. Handout PNAS NewsShaded relief map of terrain beneath the vegetation at major temple sites in the Angkor region, with elevation derived from the lidar digital terrain model at 1 m resolution. Top left: Bakong (late 9th century). Top center: Phnom Bakheng (late 9th century). Top right: Pre Rup (mid-10th century). Middle left: Chau Srei Vibol (11th to 12th centuries). Middle center: Beng Mealea (early 12th century). Middle right: Angkor Wat (mid-12th century). Bottom left: Preah Khan (late 12th century). Bottom center: Ta Prohm (late 12th century). Bottom right: Bayon (late 12th to 13th centuries). Red denotes modern linear features such as roadways and canals. The laser technology, known as LiDAR, works by firing laser pulses from an aircraft to the ground and measuring the distance to create a detailed, three-dimensional map of the area. It’s a useful tool for archaeologists because the lasers can penetrate thick vegetation and cover swaths of ground far faster than they could be analyzed on foot. LiDAR has been used to explore other archaeological sites, such as Stonehenge. In April 2012, researchers loaded the equipment onto a helicopter, which spent days crisscrossing the dense forests from 800 metres above the ground. A team of Australian and French archaeologists then confirmed the findings with an on-foot expedition through the jungle. Archaeologists had already spent years doing ground research to map a 9-square-kilometre section of the city’s downtown area. But the lidar revealed the downtown was much more expansive — at least 35 square kilometres — and more heavily populated than once believed. Handout PNAS NewsThe 10th century “ephemeral capital” of Koh Ker. Top: previously identified features in the central area (19). Bottom: lidar-derived hillshade model of terrain beneath the vegetation from the same angle, with elevation derived from the lidar digital terrain model at 1m resolution and 2x vertical exaggeration, showing an array of previously undocumented elements such as ponds, reservoirs and mounds that are not delimited in space by any form of enclosure. Red denotes a modern road. Researchers don’t yet know why the civilization at Mahendraparvata collapsed. But Evans said one current theory is that possible problems with the city’s water management system may have driven people out. The next step for researchers involves excavating the site, which Evans hopes will reveal clues about how many people once called the city home.